Slide the City Was All Smiles! You just can’t help but grin the whole time you are sliding, twisting, turning, two blocks down on an intertube. 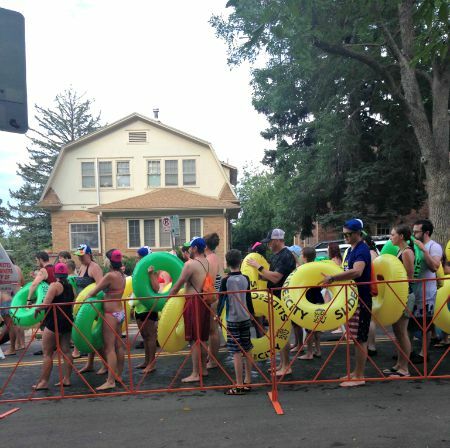 Yes you heard me – 1000 feet of waterslide right on a real city street! See? Smiling! My boys had a blast this weekend at Slide the City. A family friendly slip-and-slide water party event. We brought our lawn chairs and towels and made an evening (you can go all day!) of it. Music was playing and kids were laughing. Even P’Diddy who wasn’t quite tall enough to slide had fun just from the atomosphere. We had an unlimited slide wrist band which not only allowed us to come down as many times as we liked, but we had 2 hours to ourselves. The lines can get intense so those 2 hours is worth the unlimited price! We made friends as they slide on by or gave us a push to keep us moving. It really was smiles all around and we can’t wait til next year! Check out the Slide the City site and see if they are coming to you this summer! 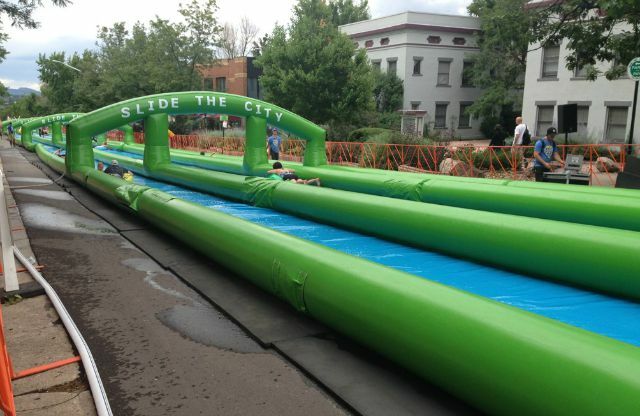 Would you family love Slide the City? 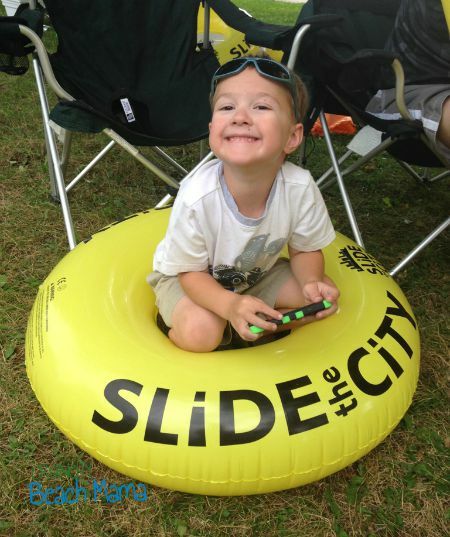 I partnered with Slide the City and US Family Guide to share this fun event. All opinions my own. ohhhhhh my the kids are jumping and down!! 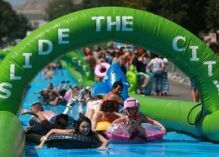 Mark your calendars for Saturday, July 18th when Slide the City comes to Boulder, CO! 13th Street will be transformed as we ride inflatables down this giant slide spanning THREE city blocks – over 1000 ft! A portion of the event proceeds will be donated to Be Boulder. Alternative Breaks, a program of the Volunteer Resource Center, sends teams of college students (between 12-18 students) to engage in community-based service projects during each college break, providing opportunities for students to learn about the problems faced by members of communities with whom they may otherwise have had little or no direct contact. This immersion in diverse environments enables students to experience, discuss, and understand social issues in a significant way, ultimately, moving students towards action to make a positive impact. Students either fly or drive together from Boulder to their location. All costs for each trip are inclusive of food, lodging, side trips, a t-shirt, education and program fees. 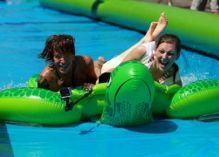 Participants can purchase a one, three or unlimited slide pass. Tickets are now available, starting at $13. See discount below! Is there an age or height limit? All who are over 46 inches tall and over 5 years old are invited to slide, but remember if you’re under 18 you’ll need to get a sign off from your legal guardians. My little guy is sooooo close. He needs to streeeeeetch a little more! If you have a group with 20 or more participants send them an email. What do you do to address water conservation? Water conservation is also a priority at our events. We strive to have zero environmental impact on the community. The Slide was designed to have zero water loss, and it treats and recycles the water safely and efficiently throughout the day. When permitted, we donate the water back to the community. Methods of disposal include local reclamation centers, parks, golf courses and other places dependent upon local regulations. My readers will SAVE 10% with promo code USFAM when you register HERE! 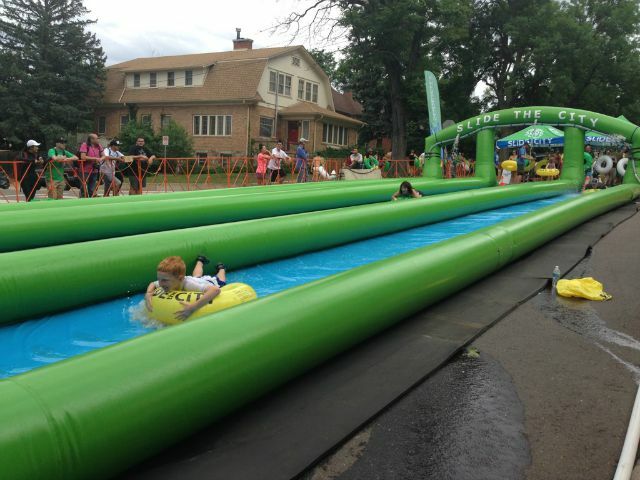 Has your family ever experienced Slide the City? Thanks for Slide the City and US Family Guide for tickets.